Meet season is upon us. 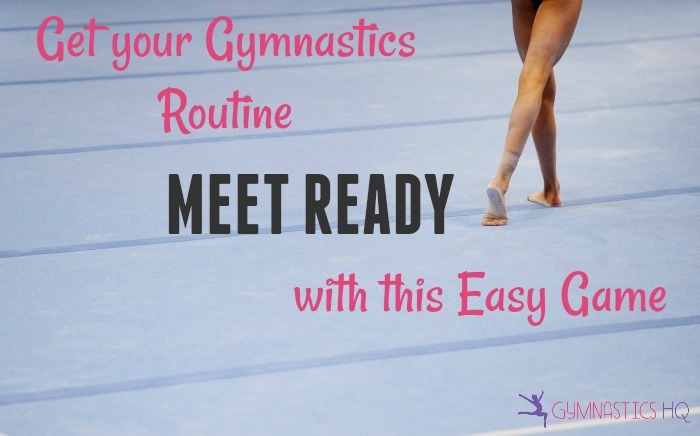 Are you looking to prepare for an upcoming gymnastics meet? Have you already learned your routines, but want to make sure you perform them great at your first (or next) meet of the season? I’ve already written about perfecting your gymnastics routine, but before you can perfect it you need to be able to perform it well. I’ve put together an easy activity you can do with a parent, a friend or a coach. This exercise will focus on improving your routine to reduce the amount of commonly taken deductions. After you have improved your gymnastics routine with this exercise, you can read the article linked above to perfect it even further. Download the worksheets, and then go through the exercise once for your routine on each event. The game is only for bars, beam and floor. In another week, do the exercise again and see if you can improve your score. I’ve picked four form aspects on each event that are frequent deductions taken by judges. There will be two positive and two negative for each event. Have someone (parent, friend or coach) watch your routine and put a hash mark in the box when they see one of these form actions happen. Only put one hash mark for each action per gymnastics skill. You want to have as many hashmarks as possible in the positive actions (green boxes), and as little as possible in the negative actions (red boxes). I’m going to describe each of the actions for each of the events. On floor the two positive actions your person will be looking for are high relevé and pointed feet. High relevé means standing on the balls of your feet, where you are creating a straight line from the ball of your foot up through your ankle. “the JO Committee has placed a great deal of emphasis on a tight relevé (stand high on the toes) position”. The two negative actions will be bent arms and bent legs. High Relevé– Whenever possible during your floor routine you should be taking steps in high relevé. Pointed Feet– All of your floor skills should have pointed feet. Judges can take deductions each time they see non-pointed feet, and they also can take deductions for the overall routine if it has a lack of pointed feet. Bent Arms– You should have straight arms for the most part, unless there is a specific piece of choreography in your routine that calls for bent arms. The other exception to this is if your coach wants your arms to be in crown for a specific skill or dance move, and then the elbows can be slightly bent. Bent Legs- You want to have straight legs (with pointed feet!) throughout your routine. The only exceptions to this are when you naturally bend your legs to jump, or push in your tumbling elements. The two positive actions for beam are high relevé and pointed feet. The two negative actions are bent legs and bobbles. High Relevé– It is especially important on beam to take steps in high relevé to improve the overall artistry of your routine. All or your turns and pivot turns should also be in high relevé. Pointed feet– You want to be pointing your feet every time they come off the beam. Bent Legs– Every time you are doing a skill and your legs are even slightly bent, or not completely straight there is a deduction taken. Bobbles- In order to execute a beam routine perfectly, the judge shouldn’t be able to tell that you are on the beam, it should be like you are on the floor. Every bobble or slight balance error is a deduction, so as your person watches the routine they should put a hash-mark down for every time you are even slightly off-kilter. The two positive actions for bars are pointed feet and legs together. The two negative actions are bent arms and bent legs. Pointed Feet– Judges can take deductions anytime your feet aren’t pointed. Legs Together– Your legs should stay squeezed together throughout your bar routine. The only exceptions are if you are doing a skill with a straddle position. Arms Bent– On bars it’s really important to keep your arms straight throughout your routine. Every time they bend the judge can take a deduction. Legs Bent– It’s also important to keep your legs squeezed and completely straight throughout your routine. The only exception here is for a skill where they are supposed to bend like for a squat on, or flyaway dismount. Like I mentioned before, the goal of the game is to increase your score each time you play. You might start out with a negative score, but that’s OK! With time, you should be able to turn your score positive. The purpose of the game is to make you more aware of how each form action adds up and will end up affecting the score you get from the judges. That was so helpful! I’m a new member and I REALLY WANT TO LEARN A BACKHANDSPRING SO BAD!!! Plz help!